Experience shows that the successful integration of digital educational resources and the step-by-step change in education in the area of STEM & 21st-century skills benefits from continuous support. Management support in making the right choices, in-class coaching for teachers, inspiring & training teachers and technical support are important aspects that need to be supplied continuously. We will give form and substance to this involvement in and from our ElimuLabs. 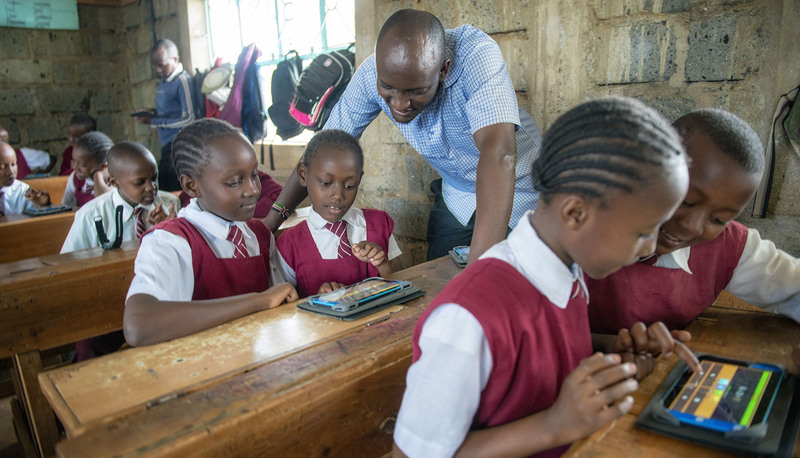 At the end of 2019, there will be at least 3 ElimuLabs in Kenya annually supporting 60 schools in improving education. We can use your support! An ElimuLab is a place from which we organise all kinds of educational activities for school principals, teachers, parents and students. All activities are aimed at facilitating schools in improving and widening their education, targeted towards the STEM (Science, Technology, Engineering, Mathematics) subjects and developing 21st century skills (competences students need to successfully participate in the society of the future). We do this by organising workshops and training courses for teachers, developing a vision with school principals, on-site life-skill training for students, in-class coaching, demonstrating digital educational resources, implementing digital infrastructures and similar activities. DEAN will set up ElimuLabs with local partners. They will organise the daily activities of ElimuLabs in their region. DEAN will facilitate those partners in developing services & products, training and support. Part of that support is provided by a network of specialised partners in the area of educational content, STEM products or hardware. We will ensure optimum harmonisation of this offer for the local educational sector via ElimuLabs and support schools in using them. Follow us and stay informed about our latest developments.